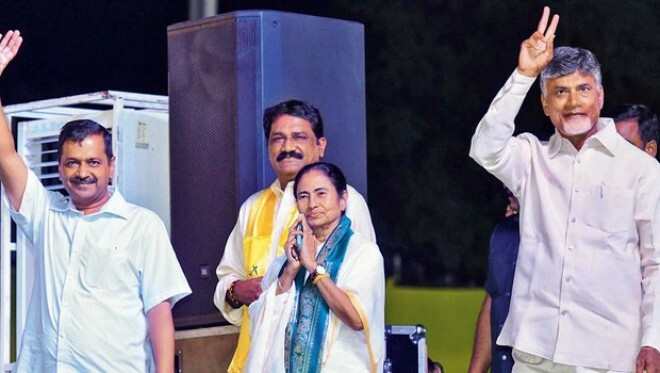 Amaravati, Apr 02: Telugu Desam Party president and Andhra Pradesh chief minister N Chandrababu Naidu invited several national leaders for his mega rally at Visakhapatnam on Sunday, but finally only West Bengal chief minister Mamata Banerjee and Delhi chief minister Arvind Kejriwal responded and attended the rally. But at the end of the day, both Mamata and Kejriwal disappointed Naidu. Not that they did not speak in favour of Naidu at the rally. Both of them praised Naidu for his leadership and his efforts to build an anti-Modi front at the national level. However, Mamata and Kejriwal did not downright a word against YSR Congress party president Y S Jaganmohan Reddy, as was expected by Naidu. While the TDP president lambasted Modi for being a chowkidar of Jagan's alleged corruption, the two national leaders confined themselves to attacking Modi and spoke only on national issues. They did not even take the name of Jagan, while asking the people to strengthen the hands of Naidu. So, that would hardly benefit Naidu. It appeared they were more interested in promoting themselves, rather than Naidu. Interestingly, when Kejriwal and Mamata were speaking, the stadium was packed with crowds, but the moment Naidu started speaking, people started leaving the grounds. It was so boring that people started commenting as there was nothing new in his speech.